Have you ever read a book that completely takes you by surprise, one you thought sounded good, but it was by an author you haven't read before so you didn't know what to expect; but then you finish the story and find yourself completely blown away by just how much you loved everything about it? Well, that is exactly how I feel about S.P. Cervantes' newest release, Wished Away. To be honest I'm a little intimidated to even write this review because I don't know what words to use to encourage readers to just go ahead and one-click this amazing book! When I read the synopsis I figured there would be a few tears shed on my part because let's face it, reading about death isn't typically easy. What I didn't realize was the wide range of emotions this story would evoke; happiness, grief, love, excitement, frustration, definitely sadness, but most of all hope. I also never expected to find a perfect balance of laughter to my tears. Yes, I was one of those sappy girls whose eyes were like a constant waterfall throughout the entire book. But they were all brought on by such a beautiful story told in the most clever and unique way imaginable. Typically when I review a book I like to talk about the actual story, but this time I'm going to forgo those details, because this is one of those times you need to experience absolutely everything, you need to go into the story knowing nothing other than this will be one of the best books you read all year. Wished Away completely grabbed my full attention from page 1. S.P. Cervantes managed to fill each chapter of this book with so much emotion that you will find it impossible to not connect to the characters. I absolutely fell in love with Jess, Dave, Gage and the entire gang of friends. The connections between each of them strengthened the bonds of love they all shared and provided the perfect opportunity to connect, to feel as if you truly understood the inside jokes, it's almost as if you become a part of the inner circle and I found myself experiencing Jess's fears of moving on when life suddenly took her on a very unexpected journey. S.P. Cervantes managed to take heavy subject matter and breathed new life and light into it, in such a way that didn't discount the original sadness of the material. Without a doubt this love story goes above and beyond the norm found in most new adult books today. My time spent with these characters will not be soon forgotten. S.P. Cervantes outdid herself with this book, she completely blew me away. 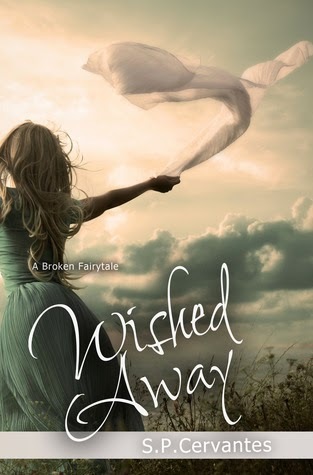 I can also go ahead and declare, Wished Away will be one of my top read books of the year.